I'm doing a Supercharged LS3 build on an 88 Vert through Hawks and had to come up with a solution to avoid heat soak. I decided to create these and when I saw how freakin' awesome they were, wanted to offer them to everyone! 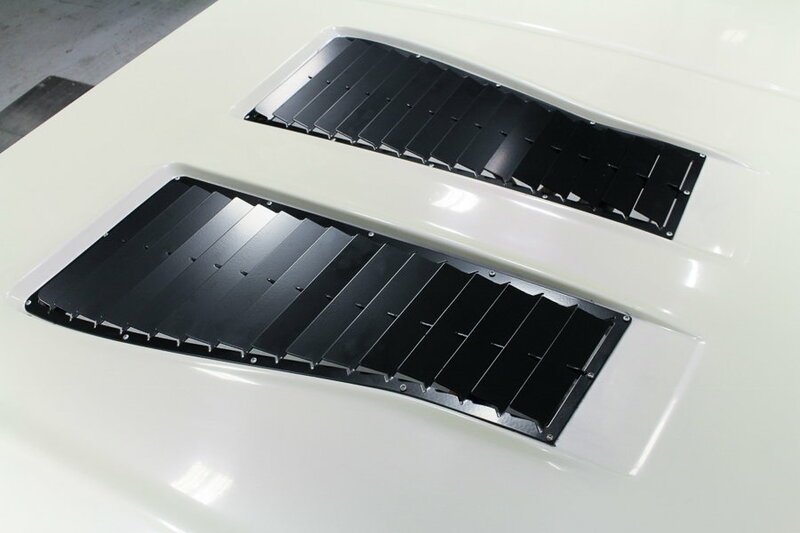 Functional Aluminum Hood Louvers made specifically for 3rd Gen's - FINALLY!!. Please check out www.camarolouvers.com for lots of pics and info. 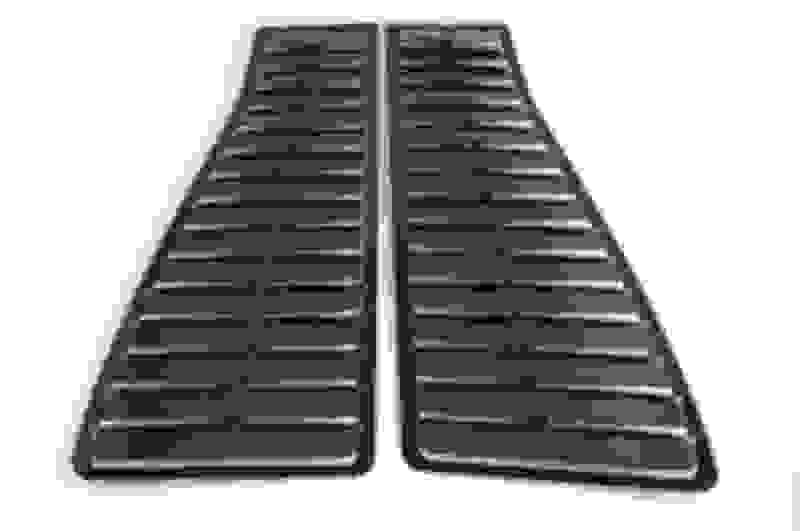 Do you have any pics of these installed on a hood? Interesting. Would be nice to see them on a hood. Are they adjustable? Did something like this on my car a while back. Yours look much better quality. May just hit you up on a pair! Hi. Thanks for your interest. The only adjustment is 15 degree to closely mimic the factory plastic and 25 degrees for a more aggressive look. I'm getting them installed this week at Hawks and will post lots of pics on the website within 7 days. Love your car BTW. That's awesome! Makes me want to put my Iroc hood back on. Thanks!! Lol. Glad you like them!! 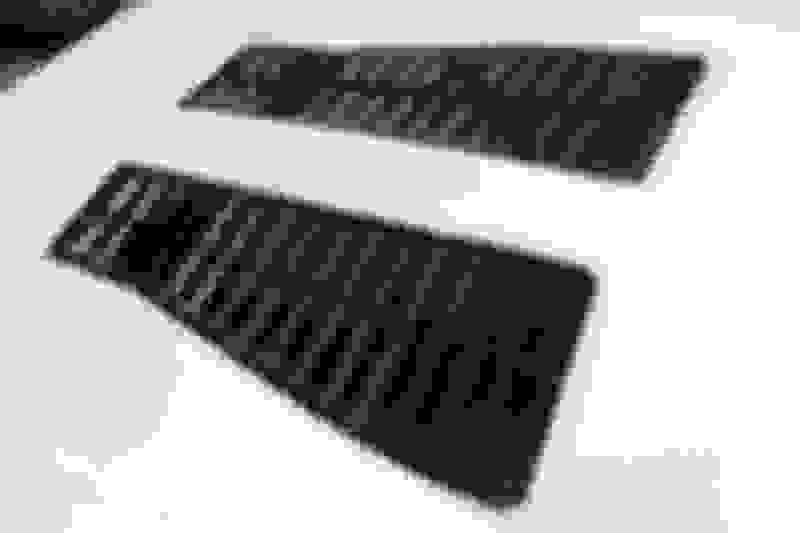 Is this 3003 or 6063 that you have laser cut from a pattern? The plain kit option 2 sounds more appealing but the markup seems high. 2'x3' of 1/8" 3003 is usually ~$40. $40??? Where? No idea what you mean by 3003 or 6063. I can tell you they're .080 Aluminum. I didn't make them, I paid someone else to do it for me. I couldn't get someone to answer the PHONE for $40. I can tell you that when you figure in R&D, specialty boxes (because they're 25 inches instead of 24") and bubble wrap for shipping, that if I only sell option#2, by the time I sell out of my entire initial inventory I will make $0 at $239 a pop. I do make a little on Option #1 but there's a PITA fee to consider. I'm just a regular third genner who has wanted these on my car forever and since no one else was making them, I had to. Thought others may like them too. Had lot's of positive response. Hope to at least end up with a free set of louvers for my own car out of this venture. That or I'll have a phenomenally expensive set of louvers on my own car and a LOT of spares! Don't care - it was still worth it - because I think they're THAT cool. How are you attaching them to the hood? 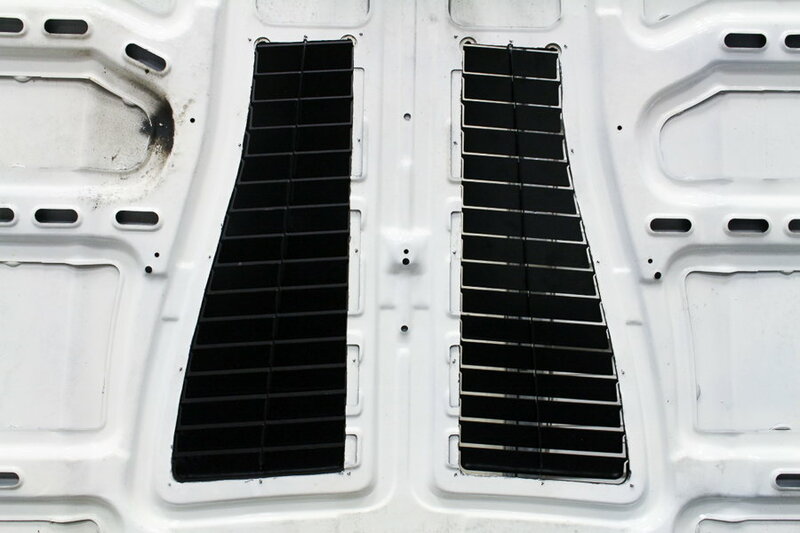 There are 12 small 1/8" pilot holes (3 per side) on the outside frame of the louvers. Hardware isn't included to allow choices for mounting. You can do hex bolts, or rounded allen bolts or rivets and grind off the top to hide. You can probably epoxy them to attach although haven't tried this. You can drill the pilot holes larger for a more aggressive look and go chrome, black or body colour. The possibilities are endless so I thought it best to leave up to customer preference. The coming install hood pics should help next week. Think I'm going with a black rounded allen bolt. Looking forward to installed pics. I like them quite a bit too. I don't have the correct hood for them but I will show them to my dad when you get the finished pic up. If he likes them, they would make a great christmas gift. I agree with you 100 percent. I am trying to reproduce amx side window louvers and every company wants like 2000 plus to do the molds and 150 my cost for the louvers. Would leave with me just about with zero profit. Then you have boxing, packaging materials and shipping. If you get paid with paypal they take 3 percent. Anyways nice job on doing these and can't wait to see them on a car. Thanks for your kind words. You are obviously 'feeling my pain'-LOL. By the way - the only other cars I have loved in my life are Javelins and AMX's. I took a 68 Javelin from Calgary to California when I was 22. Loved that car! I wish you the best on your louvers - they sound really cool too! 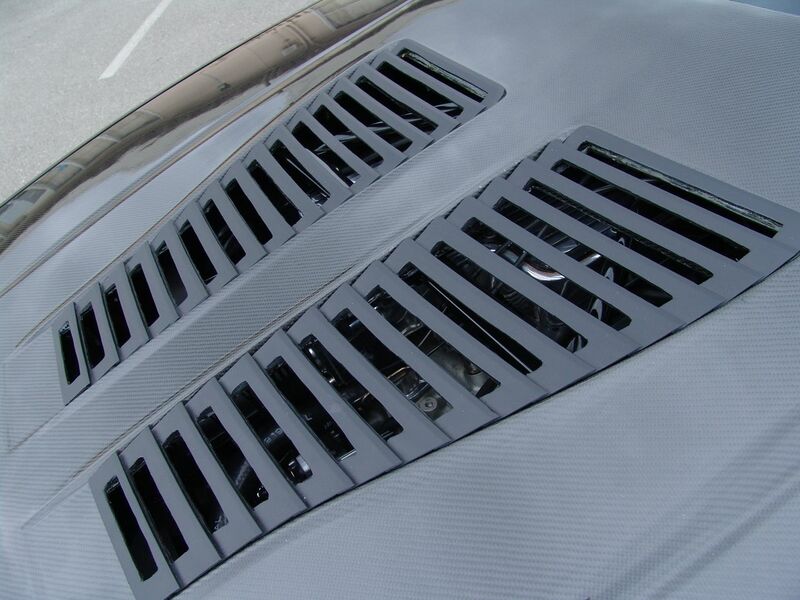 As promised - I now have many installed pictures of our Functional IROC Hood Louvers up on our website www.camarolouvers.com . Check out the home page as well as the Gallery + Louvers to see what the Textured Aggressive Set looks like installed on the hood of my 1988 Convertible. We used silver screws (on a few pics) to mount them on purpose so you can easily see the mounting points. The end result (after my hood is painted) will include black allen bolts. You can see that they're not very noticeable - even in silver. 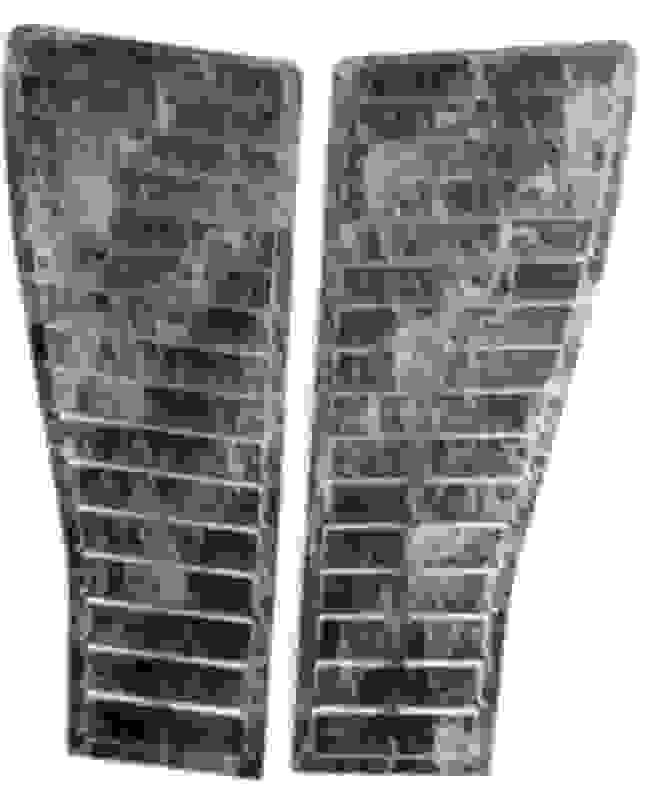 One pic shows no screws on the left one so you can get an idea of what they would look like if you rivet them on instead. The Low Profile Smooth Set pics should be up tomorrow. The hood was cut with a ziz wheel/cut-off wheel. I would recommend using some touch-up paint to seal the cut edge. 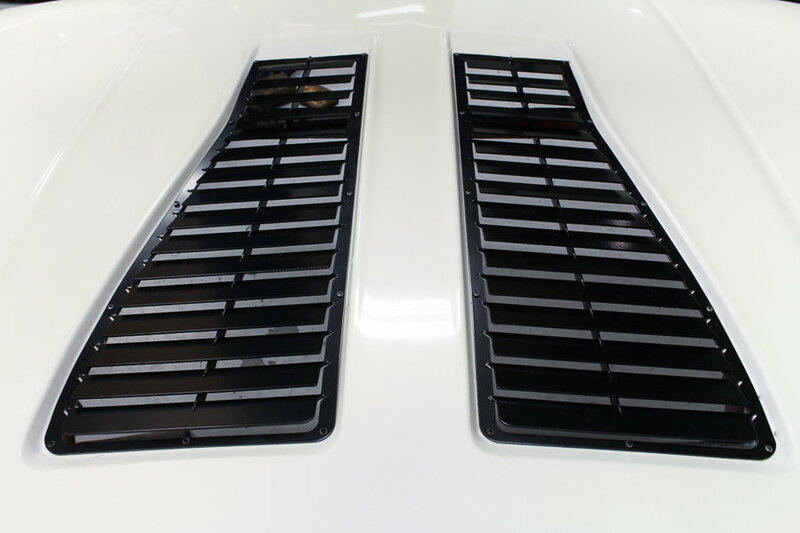 Thanks for your interest in the Louvers - hope you love them as much as I do! Looks great can't wait to see that motor installed too. Thanks - should be north of 650HP at the wheels. Awesome! Will you be painting the car? I'm not as pleased with these as I thought I would be - like the ones in Post #3 better. I think it's a great idea. It looks original, but is functional. Not only does it allow for cooling and to help release the high pressure air under the hood, but being steel it should be more robust than the original plastic louvres. Glad you like them - oh and they're aluminum - not steel. But robust they are!! Last edited by krio; 03-06-2015 at 09:54 AM. Im jealous. That's pretty much what I want to do to mine someday. Oh please don't be. I've waited 23 years from the first time I bought this car until today's 'Xtreme Makeover - IROC Edition"
I'm proof that "Good things comes to those who wait"
Just got photos of the painted engine bay. Pics should be up on the site under Gallery + IROC-X by days end. Please don't take my opinion personally - you've put a lot of effort into making them the way you wanted & that's a huge investment in time & effort. I've reproduced on my own a few GTO parts and know what it takes - I applaud you! For me however, the perimeter mounting flange with the exposed fasteners and the supporting rib in the center are too much of a departure from the original for my taste. So to keep the price under $3,000 a set (ie - unsellable) - this was the best I could do. I built them for heat dissipation from my supercharger - so necessity was the mother of invention. Those are very cool! If i didnt love my hood blisters so much id concider buying a pair. Ohhhhhhh man, I like those!!!!!!!!! ....I can see how some may see them as a departure from "stock", but then the desire to modify from the beginning pretty concedes that point anyway. I will say that if I were to have them made myself (assuming it was financially feasible) I might've tweaked just a few things, but still.....AWESOME!!!!!!! ....so I might've missed it, but you mentioned inventory. How many do you have? ....I actually like the aggressive. I figure if yer gonna do it, I mean......might as well do it!!!!! I had NO plan on spending money on appearance and detailing 20 minutes ago.....I am SERIOUSLY considering these! But I AM a thirdgenner....I do a lot of tire kicking. Without a doubt, the most entertaining response so far!!! So glad you like them! I have less than 20 left. Don't kick the tires too long . Out of curiosity, what minor tweaks would you do? Thanks for your lively endorsement!! ....well you know, with family, house, dog, other hobbies, the money isn't quite as abundant as it once was....LOL, but we'll see. ......my only real first thought was that the approximate 1/2" flat perimeter around the "louvered" section might be a little thinner.....but I guess you need some structure so they're strong enough to bolt them down with. ....and again, that's just nit picking. I love em! You should talk to Bruce at Hawk's Thirdgen. ....I bet he'd be interested in these. He may have no interest whatsoever. He may buy 'em all. Who knows, but it's worth a shot. ....there's a lot of shops out there happy to make a dollar by selling you parts, and Hawk's is no different, but I think Bruce is one of the few who genuinely wants to help bring new products, whether it be custom or repop, to the market to help better the hobby. Hawks will be marketing these shortly. He actually installed these in my hood for me and the pics came from him. My car is with Bruce getting a complete restoration over the next few months. 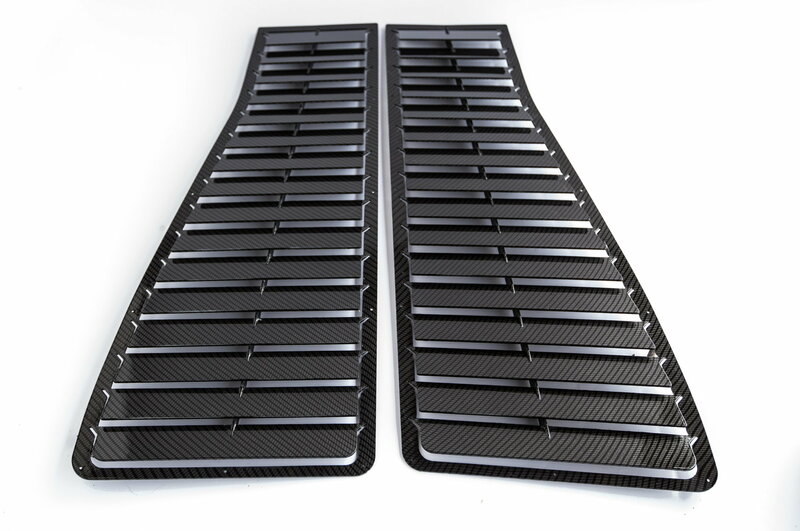 Hawks will be selling the low profile smooth finish louvers - Bruce thought they looked awesome and were his favorite. Thanks very much for the recommendation! Man that's awesome! ....but he's only doing the lower profile? ...guess I better get the aggressive one's from you then??? So to make sure I am understanding this, when this batch is gone you don't intend to produce more of them? By the way, I love these louvers, I am trying to prioritize my limited Camaro budget. As for your inquiry as to how long these will be available for purchase, I'm sorry to say I really don't know. They are selling although not as crazily as I thought they would. I am still quite a ways from just recovering my investment to bring these to market. Having said that, they ARE selling and since I think they're so cool, and my initial investment is over and done with, I am not thinking of pulling the plug anytime soon. So you definitely have some time and shouldn't stress out about it. The hard part is getting the word out on them - I am trying to make the 2015 Third Gen Expo in Illinois on May 23, I think once people see them installed in person, they'll sell like hot cakes. Hawks Third Gen is furiously working to finish the car by May 19th so I can fly in and pick it up. Goes for paint tomorrow. I'll keep your user name (like I could forget it) so I will give you a heads up before I make any rash decisions like pulling the plug. Oh and by the way.... My advertising on this site ends May 5, 2015. So although all of my posts may be deleted here - you can still find me at www.camarolouvers.com and my email can be found in the contact tab. Krio- put me on the list as well for a set before you discontinue making them as I'm still on the hunt for a hood in useable condition. That task is proving to be more difficult than I imagined. Given the amount of money you are spending I should probably just give you the user-name, my spend is pretty mild compared to yours. I love your build, except for the automatic transmission; this is pretty much exactly what I would build if I won the lottery. It is not too late to change to a T-56. I am roughly the same age you are but, my wife certainly doesn't let me have that kind of play money. I am looking for a couple of odd-jobs to earn a little extra cash so I can get a set of louvers in the near future. Keep posting updates on your website so us "have-nots" can see your beautiful build as it progresses. I thought about the T56, but it's always been an automatic, I'd probably kill myself in a standard and the fact that I smoke, am inherently lazy and love slurpees, there would have been too much going on for me to steer effectively. I think it should go like hell anyway and am hoping to pick it up in 34 more sleeps - but who's counting. Having said that, this build got away from me a bit and it became a "in for a penny. in for a pound' odyssey. Bottom line is I'm really excited and will definitely update the website. I think Hawks is doing a video (set to Rock and Roll Fantasy by Badfinger). Plus my wife is now a photographer ( ) so when I get it back we'll take some shots in a ring of fire and all sorts of other stuff. She can make it look like I am hanging out of the car armoralling the tires at highway speeds - really hilarious looking. This is kind of like customizing your customized louvers!